Why is it that when our loved one gives us a bouquet of flowers that will last about a week, then die, we are so deeply touched and feel so loved and love them in return, yet we don't feel the same about the Creator who has filled this entire earth with countless flowers of every fragrance and description, renewed constantly, just to bring us joy and we take it for granted. We don't thank Him. We don't even acknowledge His gift of love. We attribute it to some preposterous "chance" event and a fictional "mother nature" instead of our "Father God". Possibly the worst yet, because of all this, we don't feel loved by Him. He didn't have to create flowers. He didn't have to create more than one kind of flower. He did this to bring us joy, to delight us and bring us pleasure. He did this to show His love for us. An unending supply of flowers from our most ardent lover. He wants us to draw near to Him, to have a deep and personal love relationship with Him. He wants us to desire to be with Him for eternity, to come to Him and be saved. If anyone spends eternity in hell, it won't be because God didn't try hard enough to woo them with His love. It will be because they chose not to return the love He lavishes on us in countless ways every moment we live. Today would be the perfect time to decide to give Him your life and have an eternity of joy to look forward to instead of one of eternal damnation which is sure and unalterable. 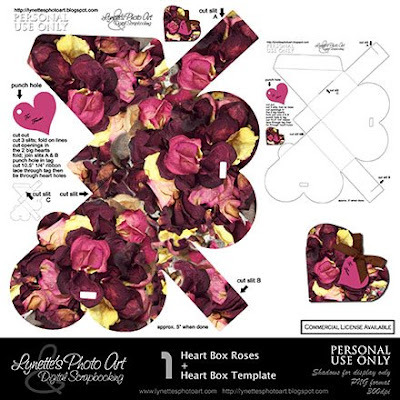 This adorable heart box I have made for you is about 5" and 1" wide when done and oh so adorable!! It fills an 8.5 x 11" paper. You could size it smaller if you wish. As I was making the template, that was the entire freebie. Then I thought it would help guide you in assembly to see one done, so I made this romantic dried roses one. Then, of course, I thought, it's made, why not just give it to you too? You can just print, cut out and assemble. It includes complete directions and is quick and easy to do. Lace your ribbon through the holes at the top of the two hearts and tie it shut with a sweet bow! I'd love to see some of the ones you make! Let me know at the bottom of the post if you like this and would like more hybrid projects in the future. FYI...these dried roses are the remains of a beautiful bouquet my daughters gave me long ago when I was ill. Aren't they the best? And the dried rose petals in the other freebie are from the last roses my husband gave me "just because". I am so blessed! This is just goregeous!! Thank you so much for sharing!! I can't wait to make it!! This is wonderful! I was wanting some new ideas for our Gotcha Day tree and this is a great one. Thank you. Super cute boxes!! Thank you so much for sharing! !